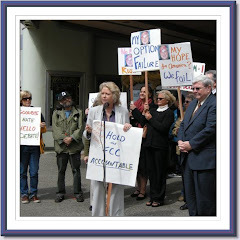 Sue Wilson Reports: Tell the FCC: Talk Radio is NOT Bonafide News! Tell the FCC: Talk Radio is NOT Bonafide News! President Obama recently nominated Tom Wheeler as the new Chair of the Federal Communications Commission (FCC), the federal agency tasked with protecting the public interest in broadcasting, particularly over our public airwaves. One of the first questions Wheeler's FCC will have to (reluctantly?) decide: Is Talk Radio the same as "bonafide news"? More than three quarters of the American public say no, according to Pew Research, and one would think an agency sworn to protect the public interest and its airwaves would agree with that vast majority. But will Wheeler choose to put the public interest first, or will his FCC continue to simply turn a blind eye, as the agency has done since the Reagan administration? This "bonafide news" question has its roots in an urgent complaint filed at the FCC in the middle of the 2012 Scott Walker gubernatorial recall campaign in Wisconsin. Two huge local AM radio stations (WISN and WTMJ) were actively promoting candidate Walker on their local talk radio programs for about 160 minutes a day, every day, even using our publicly-owned airwaves to recruit volunteers for the Walker campaign. But neither station would allow a single supporter of the other candidate (Democrat Tom Barrett) on their shows. Such selective private censorship over our public airwaves violates not only the First Amendment - by denying certain individuals free speech - but also the "Zapple Doctrine," a little known FCC rule (also called the quasi-equal opportunities rule) that requires stations to provide comparable time for supporters of both political parties when it is requested. With assistance from the Media Action Center (MAC), Wisconsin citizens filed a complaint on May 24, 2012, expecting to have the matter resolved before the 2012 general election. But nothing happened. MAC next filed a legal petition to deny the operating license of WTMJ. That finally forced WTMJ attorneys to respond, and respond they did --- with a Hail Mary maneuver, asserting, among other things, that their talk radio shows (which use the airwaves with biased political intent, including the use of racist comments) are actually "bonafide news." Historically, lawmakers understood the need for a firewall between political rhetoric and real news reporting, because the "bonafide news" exemption was ensconced in the 1934 Communications Act. ("Bonafide news" programs get the exemption so they can report on candidates' events as they occur.) It remains the law to this day, and WTMJ, despite the content they actually provide over our airwaves, is now attempting to exploit that provision for all that it's worth. And, if they are able to continue to do so --- it is worth plenty. And on the issue of "bonafide news," if the FCC does what it normally does --- that is, cave in to industry desires --- we can say goodbye to any firewall between true journalism and propaganda over our public airwaves. 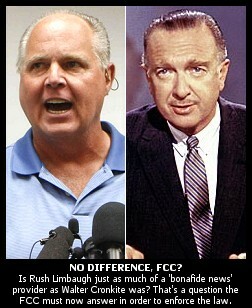 The blurring between fact and opinion will go unabated, and Rush Limbaugh will be featured in journalism textbooks alongside Walter Cronkite. The good news is that three quarters of us DO understand the difference between opinions and news, so we have time to turn back the tide. It starts with this petition. Please sign it and share it with others: Tell the FCC: Talk Radio is NOT Bonafide News. We'll deliver the petition with everyone's signatures to FCC Chair Wheeler upon his expected Senate confirmation. We will see what he does, and we will act accordingly. Care to show your ownership papers, the real question is what forms of government dictate the content of any media? hint dictate is part of the name.